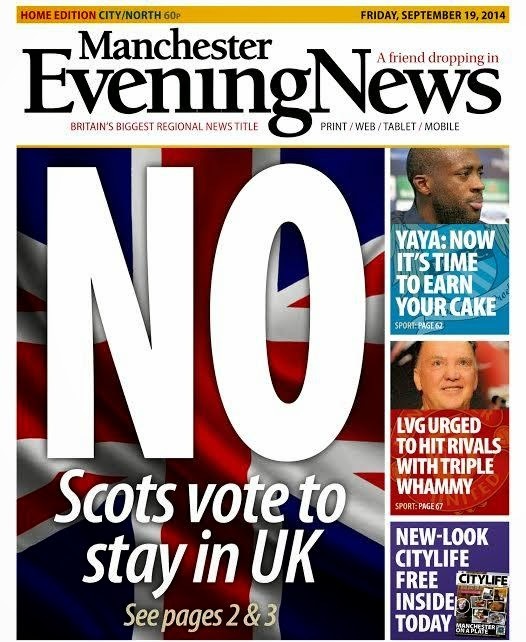 The chances are the newspaper you saw this morning didn't have the result of the referendum ... but the newsdesks were certainly working through the night to produce 6am editions. 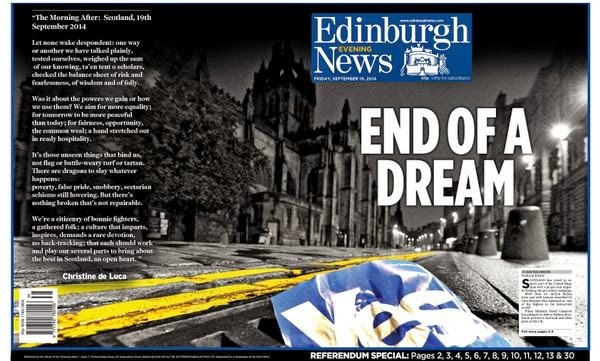 My favourite is the Edinburgh News. The image is not one of celebration ... just one that reflects the mood. The morning after the night before. 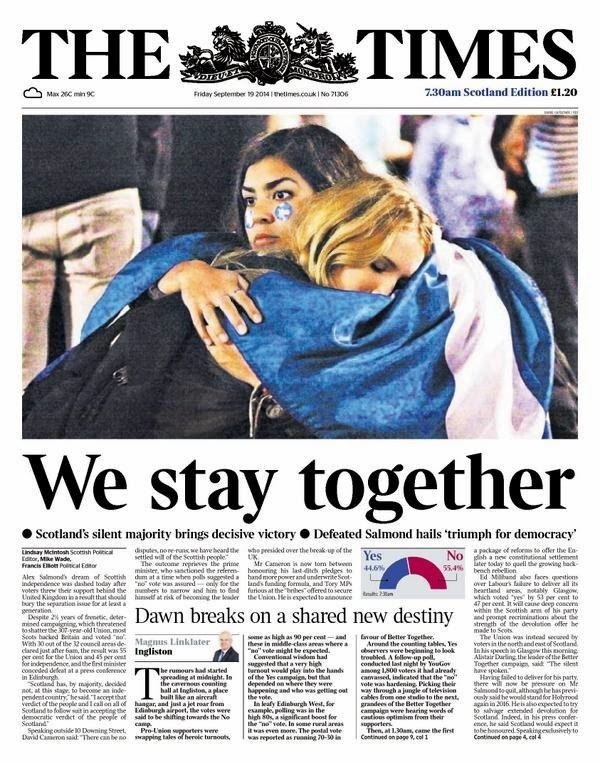 This is how the night (and morning) unfolded in the newsrooms on both sides of the border. 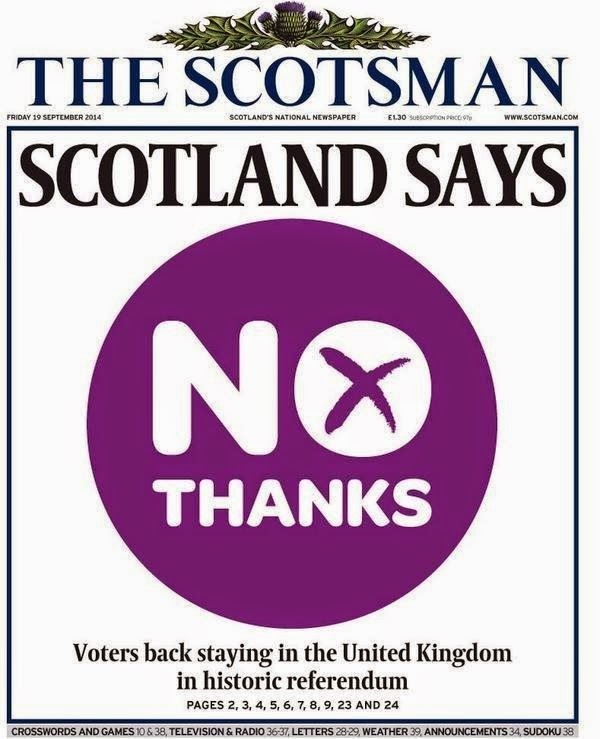 The Scottish Daily Mail. 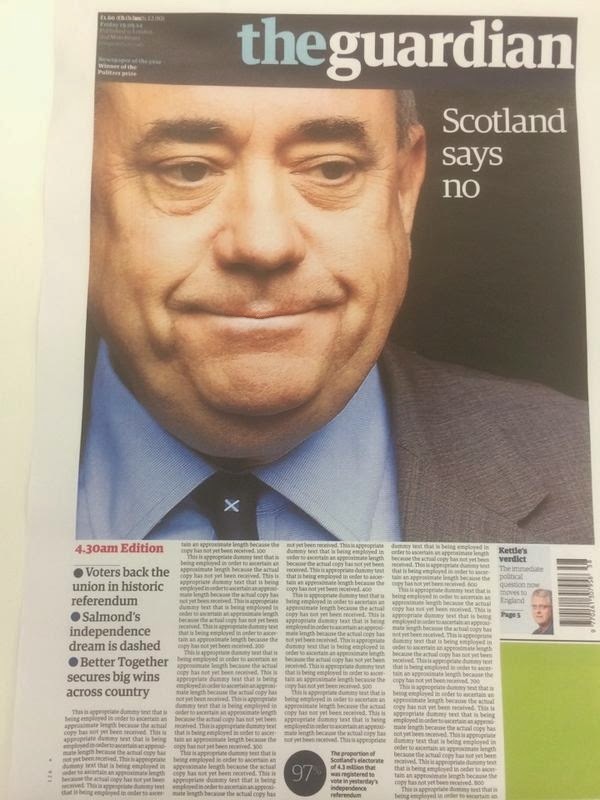 Great picture of Alex Salmond. 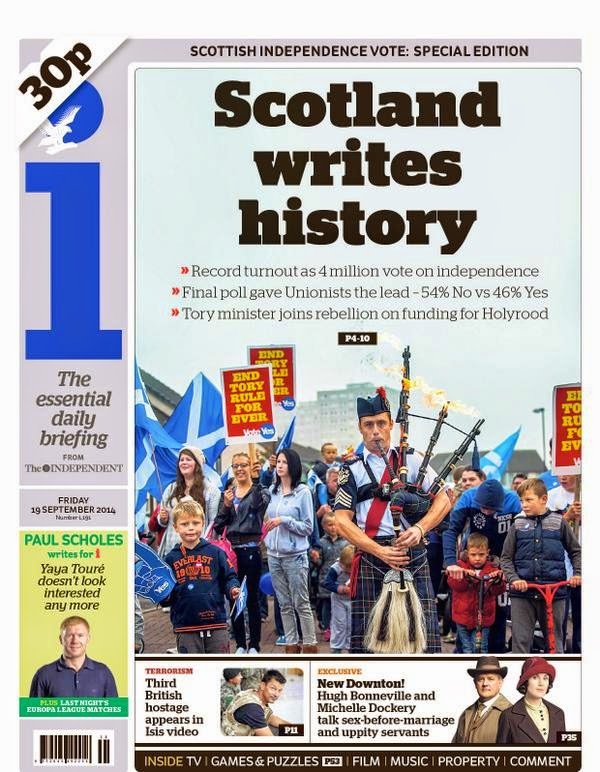 I was particularly pleased to see Rachel Watson's byline on this. 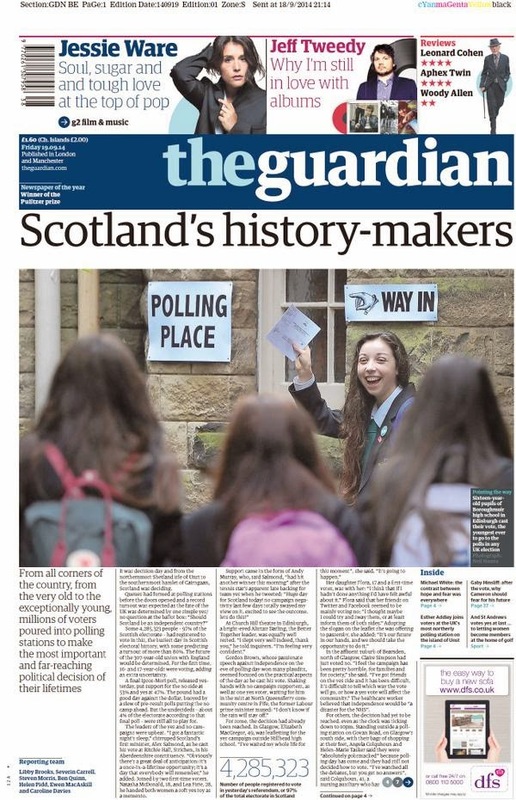 Trainee in Kensington last week, front page in Glasgow this week. Well done to her. 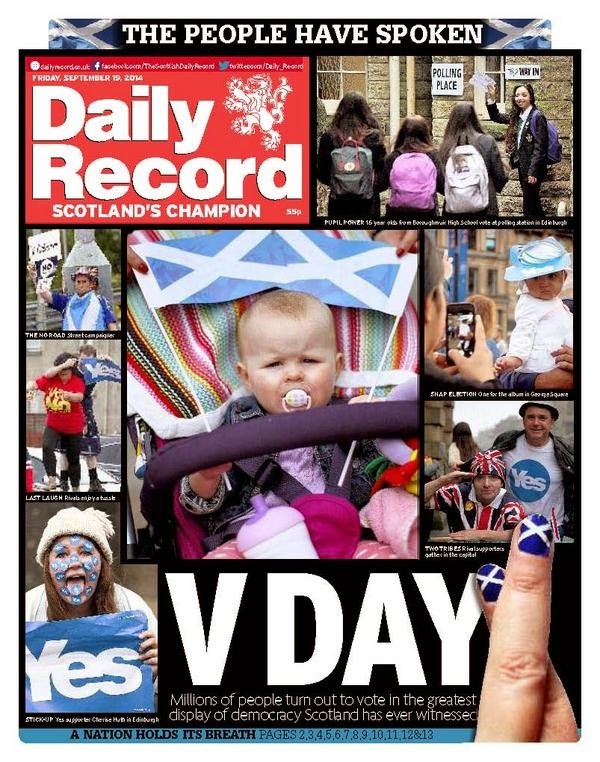 The Daily Record has enjoyed an excellent campaign with some memorable fronts. 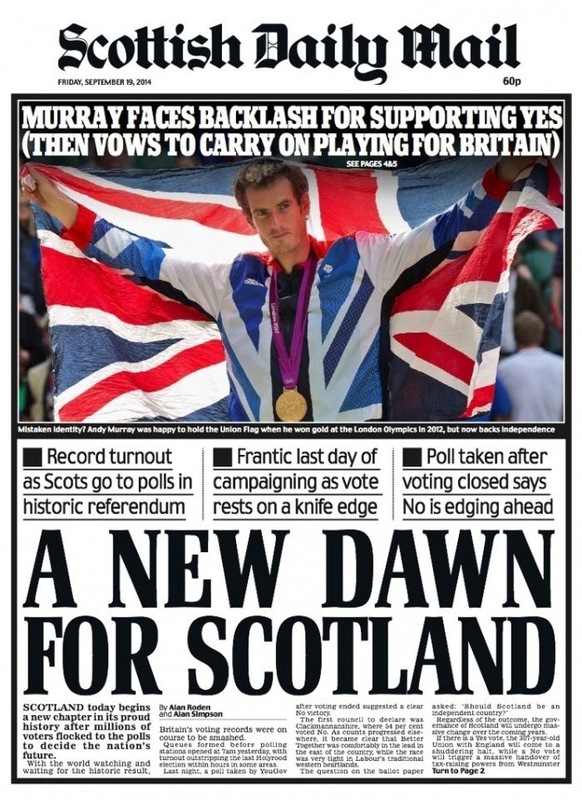 It doesn't disappoint this morning ... New Scotland ... new Britain is a nice headline. 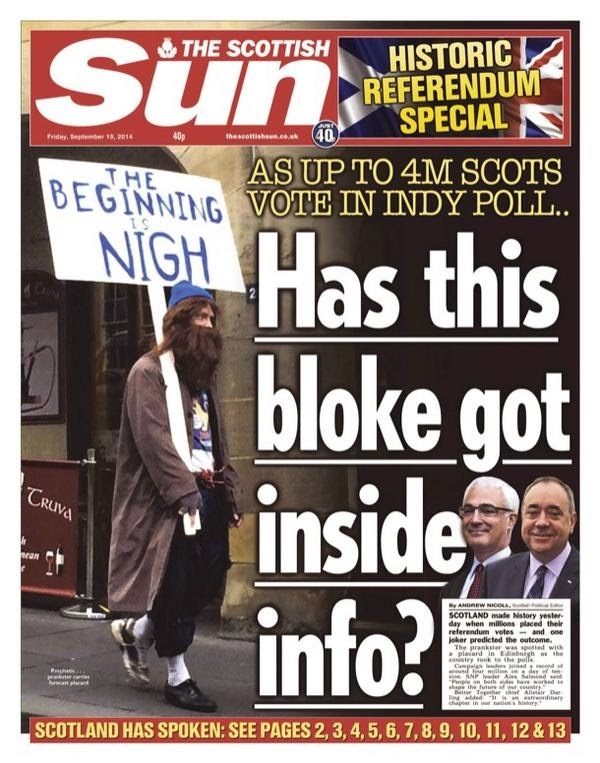 The Scottish Sun's holding front page is just silly ... but it goes for it big time this morning. The merging flags and Reunited Kingdom headline are simple but very effective. 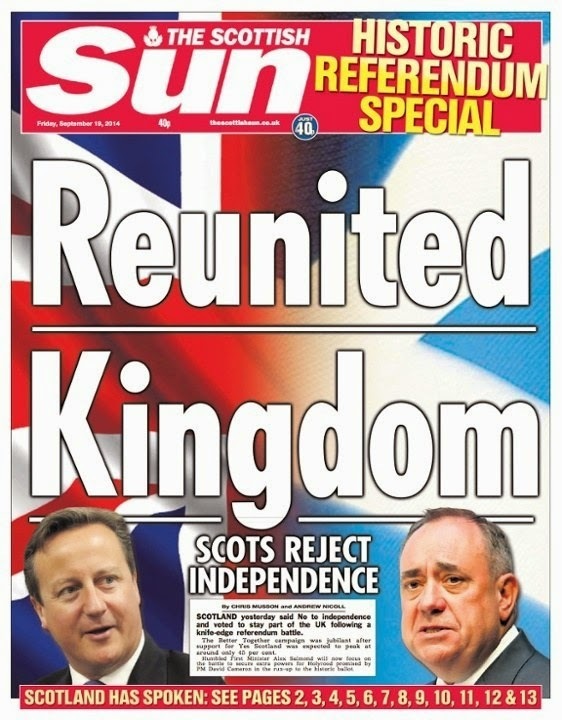 The English Sun's morning page is a bit stronger though. 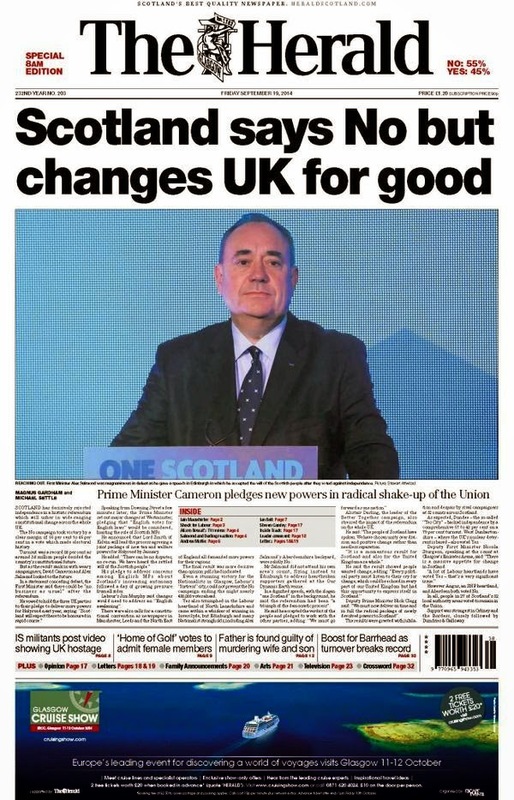 Union back, adapted from the earlier edition, is a nice line. 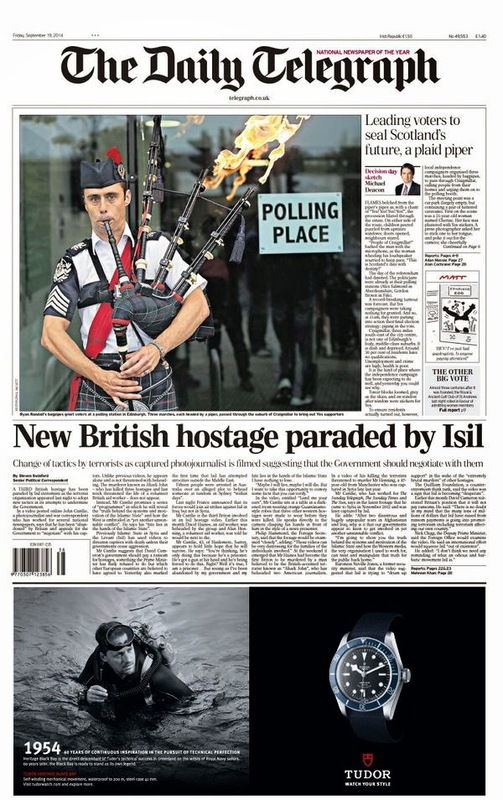 The Daily Telegraph's picture across the top, with the white titlepiece embedded, is very strong. 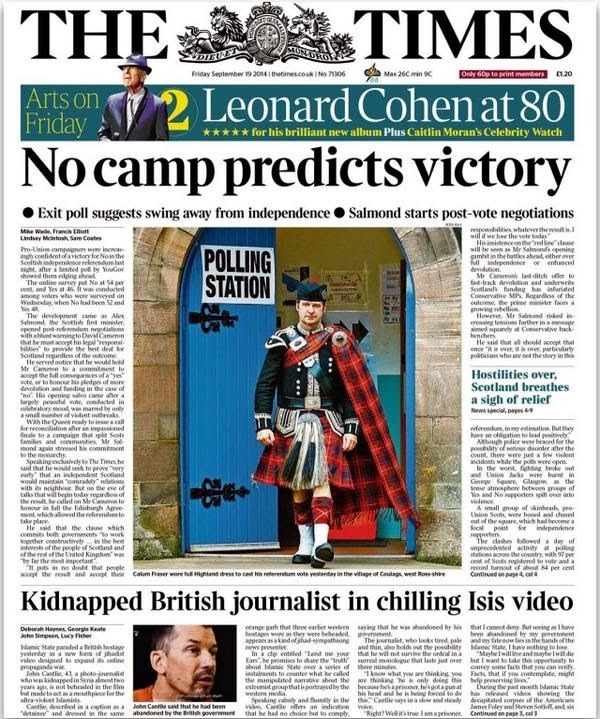 The second edition headline just about squeezes in above the fold. 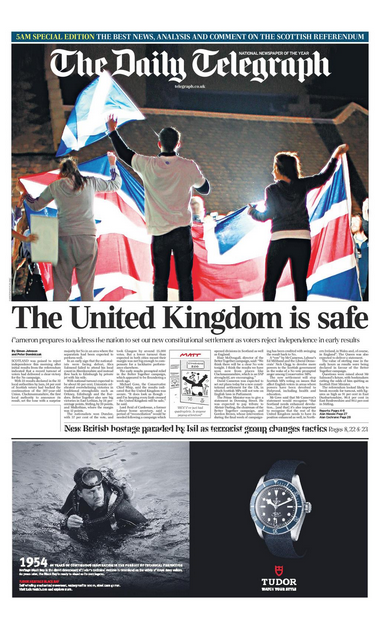 Nice picture on The Times too ... although the relationship with the picture is interesting. I guess the couple hugging aren't that happy about staying together. 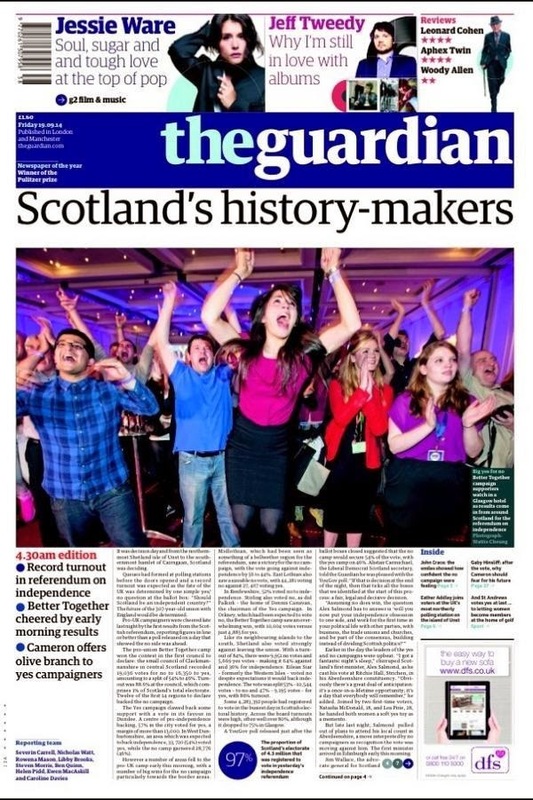 The Guardian changed its picture midway through the night ... and then there was a wholesale change to capture a very hacked off Alex Salmond. 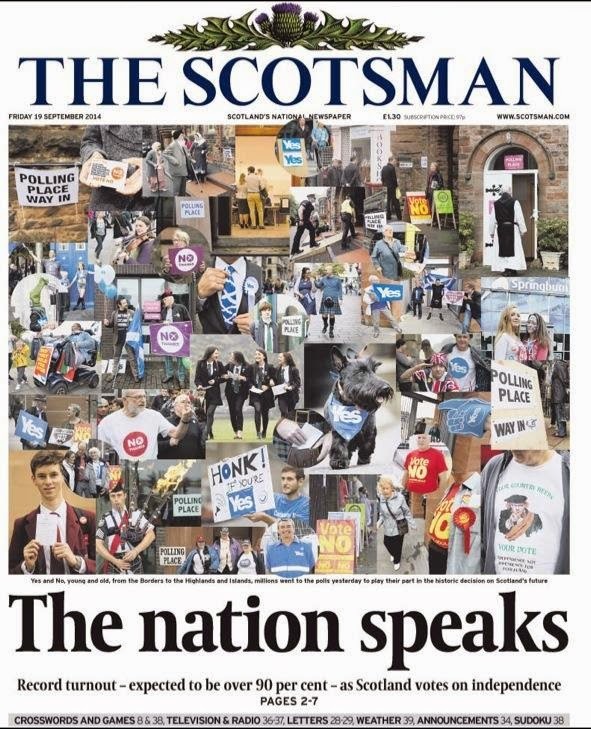 The Scotsman goes from clutter to simple clarity. 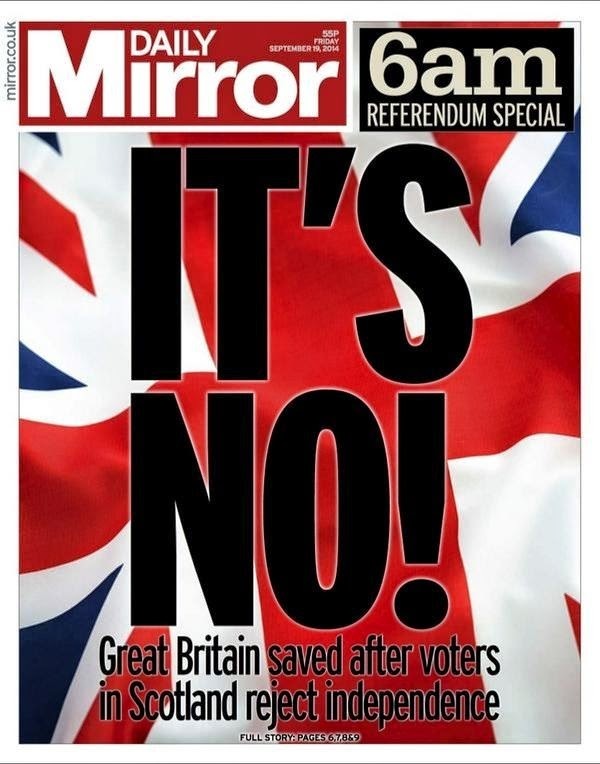 No doubting the result in the Mirror. 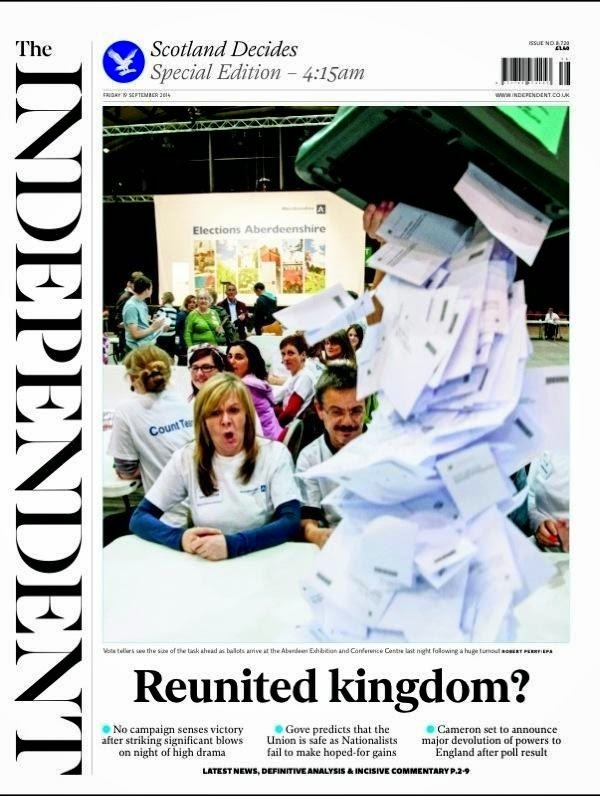 The Independent might have taken a gamble at 4.15am and dropped the question mark. 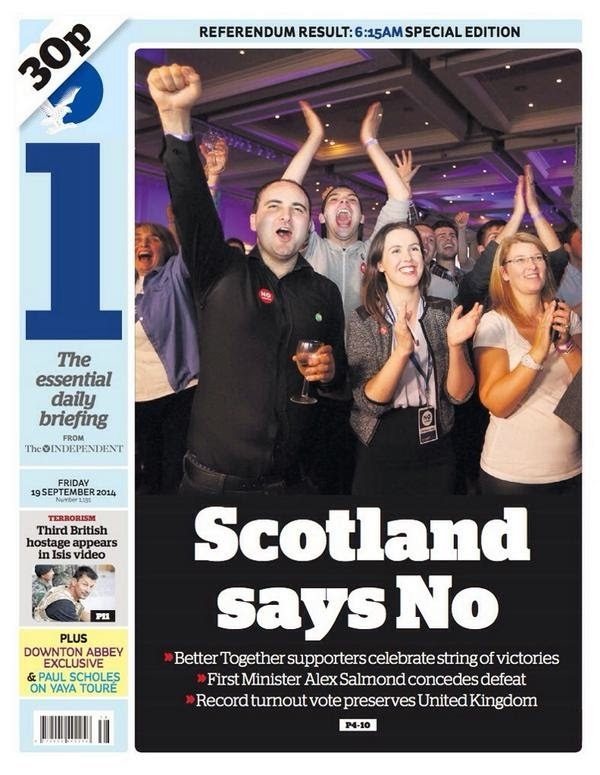 Not sure the lady in the front of the picture will thank them for this shot. 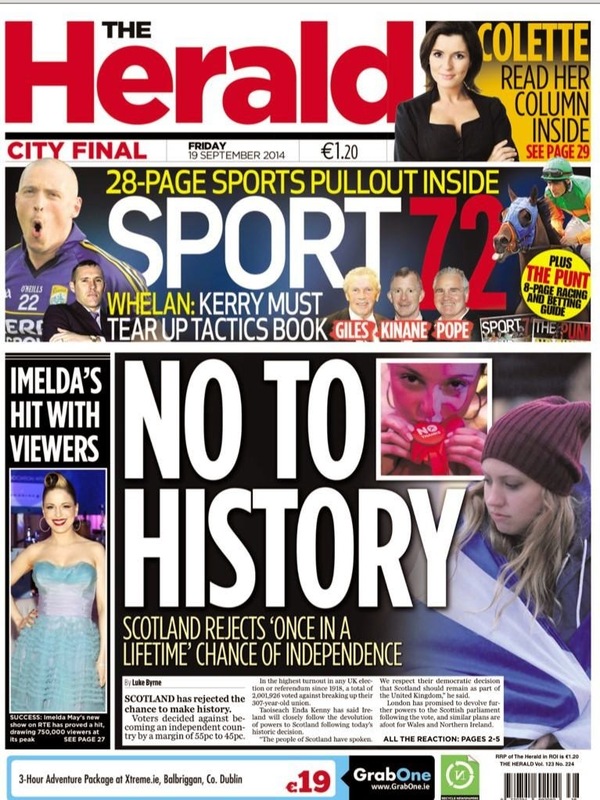 Good changes at The Herald. 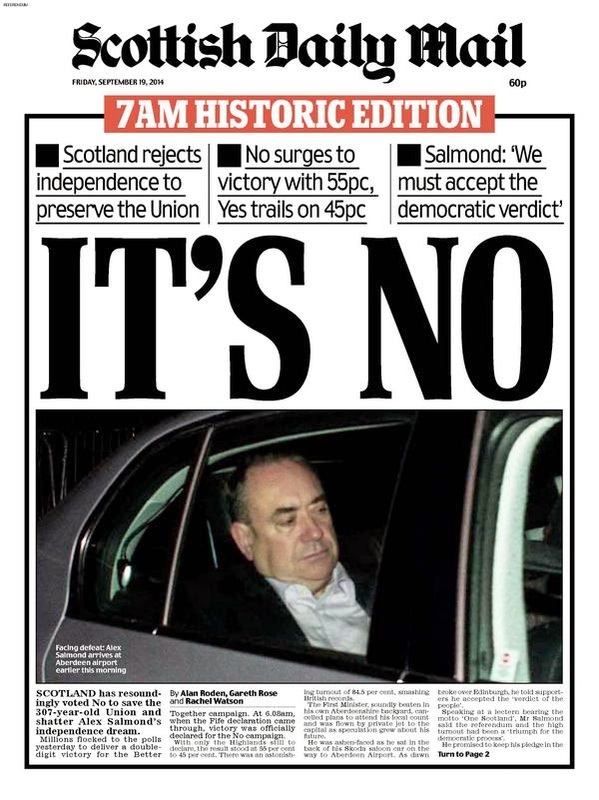 The crop on Salmond in the car not as effective as the one on the Scottish Daily Mail. 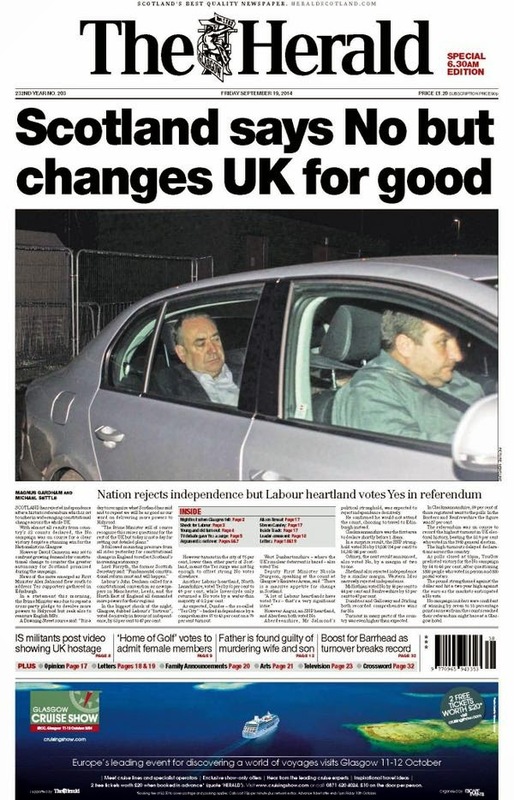 Why the front seat passenger and wing mirror? Not surprised it changed again. 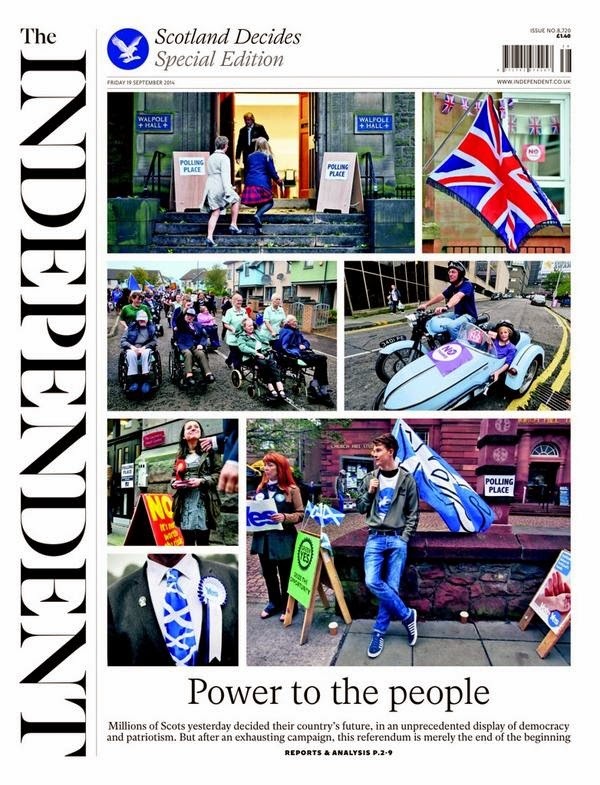 From piper to partygoers, the i goes blue for the day. 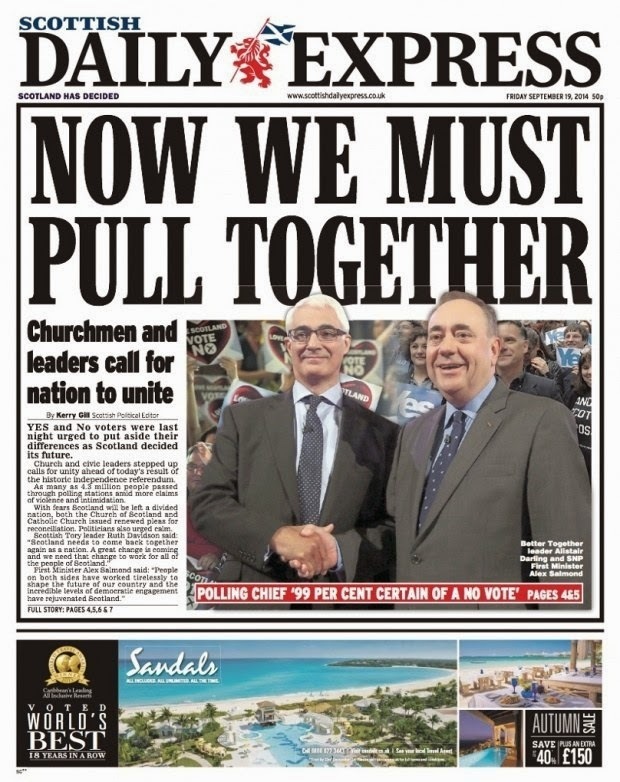 Not sure if the Express updated this one - a generic lead headline that would have stood whatever the result. 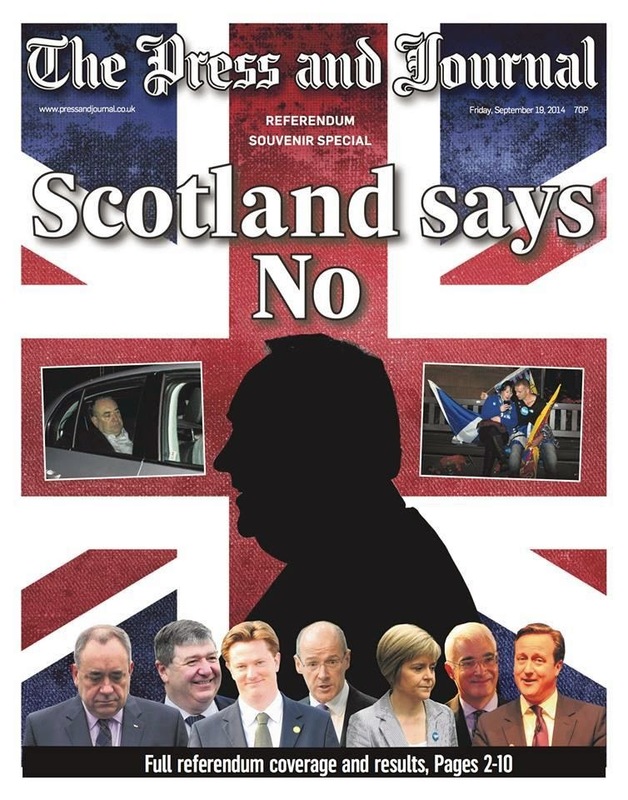 The Press & Journal in Aberdeen uses Salmond as a shadow across the Union Flag. Poignant? The regionals were busy too. 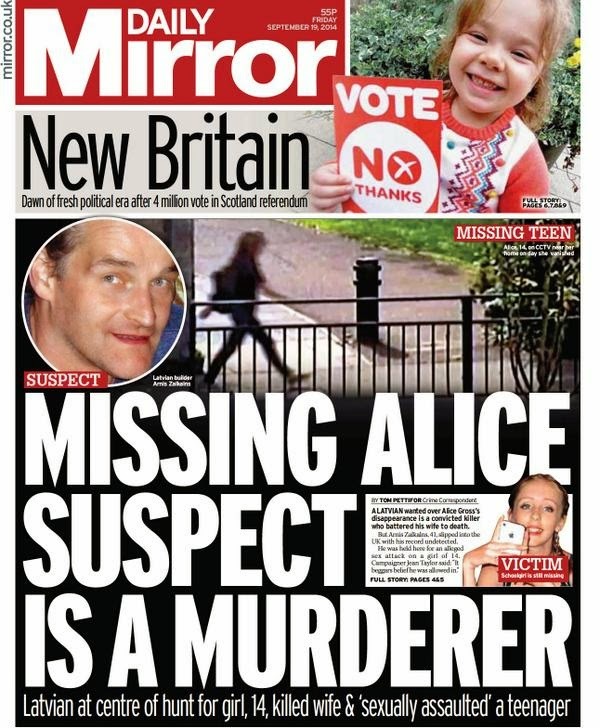 Here's the Manchester Evening News. 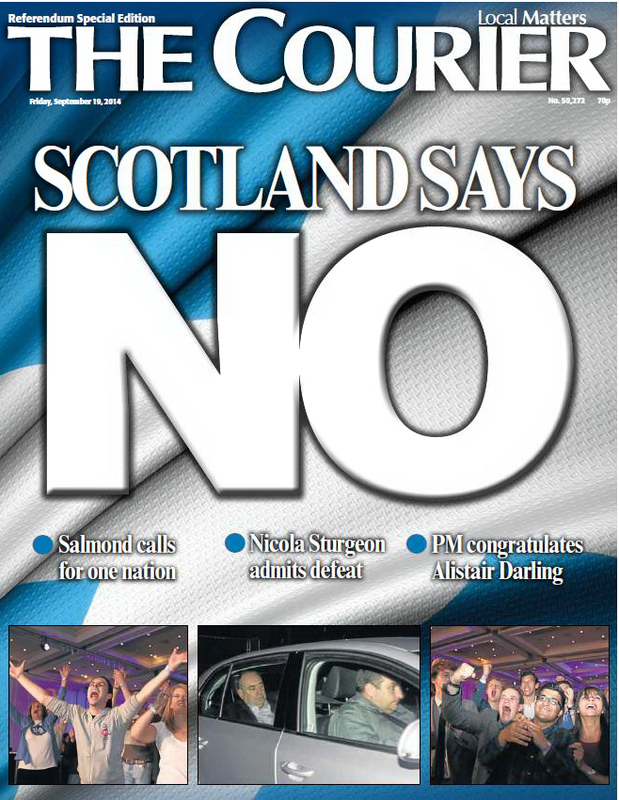 The Courier - based in Dundee. 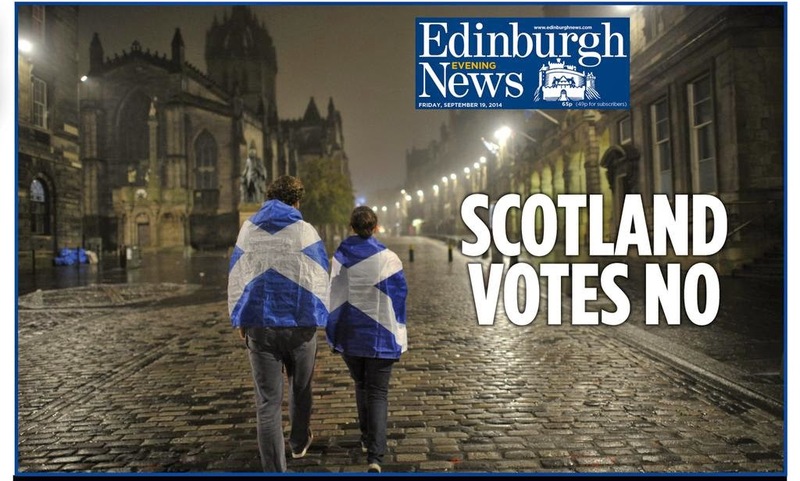 A great job by the journalists ... now go get some sleep.